Musician and producer Oliver Ignatius builds his Meadow Street studio and collective with an eclectic cast of performers. 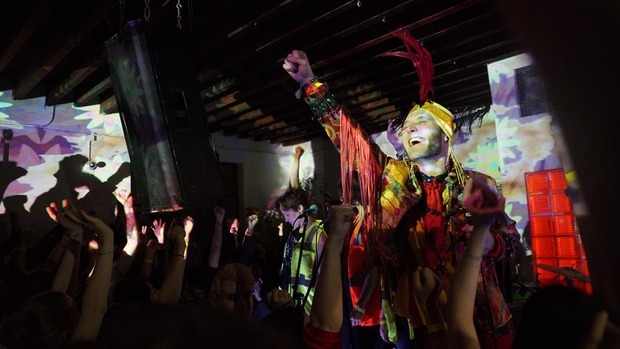 The DIY music landscape in Bushwick contains plenty of nooks and crannies. One particular collective, the Meadow Street-based Mama Coco’s Funky Kitchen, has been reinventing itself with every new entry into its canon with producer/musician Oliver Ignatius at the helm. Mama Coco’s Funky Kitchen is a catchall title for the physical recording space where Ignatius spends a staggering amount of time recording music. It also serves as the name for the extended family of artists who find inspiration and solace in the space. With DIY havens closing or struggling to stay open all over the country following the Oakland Ghost Ship fire, a space like Mama Coco’s Funky Kitchen is as important as ever. The wide range of Mama Coco’s produced efforts, as well as various covers and underground events including a “gender blender” Bowie vs Prince tribute last summer, reflects the diversity of interests at the studio. It was an initial move to New York, however, that opened Oliver’s eyes to the realities of what’s required beyond just being a talented musician. Ignatius returned from his travels and met his creative partner and now wife, Bernadette Higgins, who first suggested that he take the little amount of money he had left from Hysterics and start a bedroom recording studio. As the number of bands and intermingling artists grew, fate would challenge the collective’s strength following the devastation of Hurricane Sandy in late 2012. The storm left the original Mama Coco’s Funky Kitchen in Windsor Terrace literally underwater. After a months-long search, Ignatius and company found a suitable space in East Williamsburg. With roughly 80 volunteer musicians pitching in, an acoustically desirable and soundproofed studio was erected. Walking into the studio, you’re greeted with bursts of vibrant color, inventive nooks including McLane’s, a bar dedicated to the beloved, passed collective member Dan McLane and a recording layout offering high ceilings and room for customization. In response to the inauguration of Donald Trump, Ignatius rallied dozens of artists in the Mama Coco’s community to cover “Straight White Patterns,” a song by the cult queer folk band Lavender Country originally released in 1973. At this session, I got to sit in as a fly on the wall and watch how Ignatius lent his talents as a singer, pianist, and producer. Ignatius sat in his producer’s chair running through pieces of the original track to detect subtle inflections in the song’s vocal styles to crack how to best re-represent it. Then it was on to the piano where he communicated with assembled friends and session players through subtle cues, chasing the golden take with each adjustment. Although Hurricane Sandy presented plenty of adversities for Mama Coco’s Funky Kitchen, 2016 was likely the most challenging year yet for the collective bookended by the rise of Trump and the tragic loss of their spiritual leader and bandmate Dan McLane in April. I met with The Harmonica Lewinskies’ Oliver Fetter at Pearl’s Social and Billy Club to hear the story of the passionate, scrappy musician who serves as a direct inspiration for how to move forward with deep appreciation of the time the group has to create. “It left the community in a state of suspended mourning which lasted a good half year. It's been very hard adjusting to the reality of Mama Coco's without Dan, but I think the loss has prompted many of us to take our work more seriously than ever before, to be more daring and willing to take risks,” Fetter said. With a variety of personal fears to grapple with, Mama Coco’s Funky Kitchen continues to challenge itself and listeners through a heightened sense of urgency. Not too long after my last stop at Mama Coco’s, nearby Shea Stadium was targeted repeatedly by local officials. Aware of the current climate, Ignatius keeps on moving. And it’s this statement that really brings everything home in terms of evaluating Mama Coco’s Funky Kitchen as a local DIY space. Filled with passionate and spiritual generous artists, the collective challenges itself against itself rather than getting hung up on passing trends. Think back to those loose b-sides or live session takes from some of your favorite artists. The warm up strums or fills, the humorous pre-roll banter, and the white-hot anticipation of hearing your idols launch into recording at the top of their game. This is the feeling you get that harkens back to your youngest self in music, with Ignatius and Mama Coco’s Funky Kitchen extending a hand, ideasm and a new bond with every take. Featured image courtesy of Rafe Scobey Thal.